When former Wyoming Rep. Cynthia Lummis (R) retired from Congress, she said only one job offer could have kept her in the nation's capital: Interior secretary. Now she might get her wish. President Trump passed over Lummis in 2017 to nominate her former colleague, then-Montana Rep. Ryan Zinke (R), but with the post once again vacant, the 64-year-old Wyomingite is back on the short list to head the Interior Department. 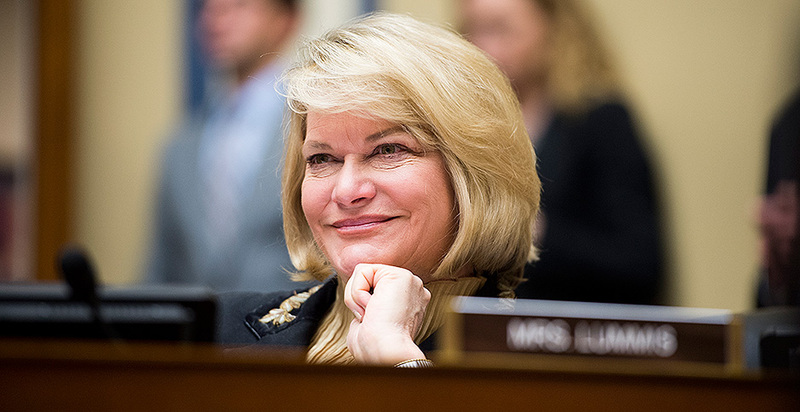 Wyoming Rep. Liz Cheney (R) is helping promote Lummis' candidacy, and White House acting chief of staff Mick Mulvaney, a former South Carolina congressman, is "a big fan, too," one former Interior official said today, speaking on condition of anonymity. By late yesterday, one Interior official was confiding the unconfirmed account that "word is, it's Lummis," according to a source. Senate Environment and Public Works Chairman John Barrasso (R-Wyo.) praised Lummis as a "terrific" choice to lead Interior. "She knows the issues. She's very knowledgeable," Barrasso told E&E News today. "Certainly, we could get her confirmed to be the secretary of the Interior. I'd encourage the president to appoint her." Barrasso added, "I don't know the status of the president's decision on this, but I'm fully supportive of her. It'd be good to have a full Cabinet in place and confirmed, and I'd like to see her be secretary of Interior." Lummis, a former Wyoming cattle rancher, told The Hill in December that she was interested in succeeding Zinke, who stepped down in January amid a series of inquiries into whether he misused the office (Greenwire, Jan. 4). "Yes, it is a position I'm interested in," Lummis said. Other candidates for the Interior secretary slot include current acting Secretary David Bernhardt, who is widely perceived as the front-runner for the nomination, as well as Utah Rep. Rob Bishop, the top Republican on the House Natural Resources Committee (Greenwire, Jan. 30). Lummis, who assisted with the Trump administration's transition and was considered for the Interior post in early 2017, returned to the White House this month for new interviews, Bloomberg reported today. Wyoming Republican Party Chairman Frank Eathorne told E&E News this week that he was "very excited" to hear Lummis listed among the top contenders for Interior. "I think she would be most excellent in that position," Eathorne said. "She is a Wyoming native, has the experiences of a congresswoman, an agriculture background, a former legislator; she knows Wyoming and understands the issues of Western states." Sen. Kevin Cramer (R-N.D.), who served with Lummis in the House, said recently that she would be his "really favorite candidate" for Interior secretary. He called her "so smart" and said she not only "understands Western and land issues, but also loves the West." "I always told her, 'You're my normal barometer,' and she said, 'No one has accused me of that.' She is a pragmatic person. She pushes the envelope to the very edge but then takes the victory at the appropriate time. She knew when to hold 'em and when to fold 'em," said Cramer, a Senate EPW member who talks regularly to Trump. The senator is personally close to Lummis and was as well to her late husband, Alvin Wiederspahn, a utilities regulatory lawyer. Cramer said she left Congress in part because of Wiederspahn's ailing health, but Cramer is hopeful that enough time has passed since his 2014 death that she might be willing to return to public service. Following her failure to nab the nomination in 2017, Lummis told E&E News that she had not pursued any other posts in the Trump administration, acknowledging she was "profoundly disappointed" that she was not selected to lead Interior. "That was the one job that I was so interested in that I would have been willing to stay in Washington for, but that was really the only one," she said (E&E Daily, Feb. 2, 2017). She described a meeting with Trump himself as "intense" during the last interview process (E&E News PM, Dec. 8, 2016). Lummis subsequently opted out of the 2018 gubernatorial contest to replace term-limited Gov. Matt Mead (R) (E&E News PM, Sept. 21, 2017). "I haven't ruled out running for governor, but I did not come home to run for governor," Lummis told E&E News several months before she decided against another bid for office. "I came home because it was time." But Lummis could still make another bid for elected office. She is widely considered a candidate to succeed Republican Sen. Mike Enzi, if the 74-year-old lawmaker opts against re-election in 2020. "I wouldn't want to pretend to be her adviser, but I would say she is so well-liked and so respected among all Wyomingites, and the Republican Party is so proud of her that we would love to see her serve in any capacity she is interested in," Eathorne said. Lummis, who served four terms as the state's at-large representative before retiring after the 2016 election, told The Hill in December she would like to focus on forest management and wildfire controls if nominated. "I have always prioritized natural resources policy," she said. "Much more needs to be done to enhance the ability of the land to resist and fight catastrophic wildfire." She told E&E News in late 2016 that she would also like to encourage cooperation between the U.S. Border Patrol and federal land management agencies if she were tapped for the Interior office. In addition, Lummis has said she would focus on access to public lands for hunters and other outdoor enthusiasts by encouraging land exchanges of federal and private parcels. "When there are lands that the federal government itself believes it cannot manage or that do not match the goals of federal land ownership, they should be allowed to sell them," Lummis told E&E News in late 2016. "So for those parcels — those few parcels, comparatively — I think they should be allowed to sell them. However, I think the better approach is land exchanges." Lummis, who was raised on a cattle ranch in Laramie County, Wyo., and earned her undergraduate and law degrees from the University of Wyoming, began her political career in the state Legislature, winning election to the state House in 1978. She went on to serve in the state Senate and in 1998 won the first of two terms as state treasurer. Lummis campaigned in 2008 to succeed retiring Rep. Barbara Cubin (R) and won. During her four terms in the House, Lummis served as a member of the conservative Freedom Caucus and earned a reputation as a fierce opponent of the Obama administration's environmental regulations. But Lummis at times also sparred with her own party leadership. Republican leaders removed Lummis from the powerful Appropriations Committee in the 113th Congress, shifting her to the House Natural Resources panel. "You don't climb the ladder in that [Appropriations] committee without subscribing to their rules," former Lummis aide Pete Obermueller told the Casper Star-Tribune in 2017. Obermueller, now president of the Petroleum Association of Wyoming, did not return a request for comment for this article. During her tenure on Capitol Hill, Lummis also ranked among the wealthiest members of Congress, thanks to her ownership of three Cheyenne, Wyo.-based cattle ranches.